*The synopsis portion of this review contains spoilers for Bullets or Ballots. Scroll ahead if you don’t want to be spoiled! Anti-crime crusader Ward Bryant (Henry O’Neill) has died. Heading up the murder investigation is Captain Dan McLaren (Joe King), who quickly fires his friend Johnny Blake (Edward G. Robinson) – who was expecting to join the investigation – for reasons unclear. 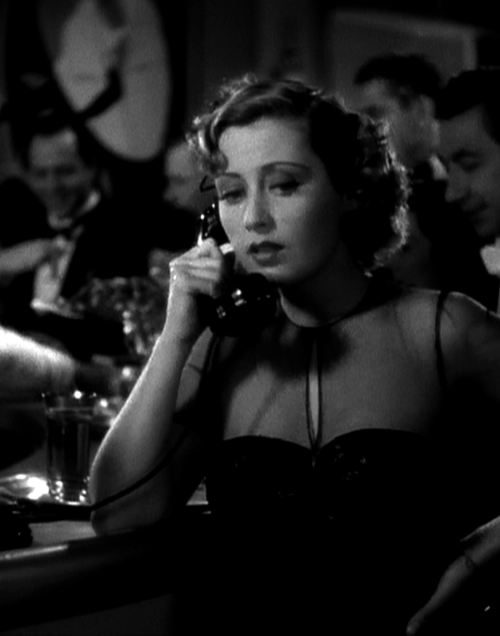 Out of a job, Johnny recieves an offer from his old friend Lee Morgan (Joan Blondell), who runs an illegal lottery with her assistant Nellie LaFleur (Louise Beavers). But rather than work with the lovely lady, he turns her down in favor of a job with Al Kruger (Barton MacLane), the man suspected of killing Ward Bryant. Unbeknownst to just about everyone, Johnny is secretly working for the police, only taking the job with Kruger so he can get underground information. 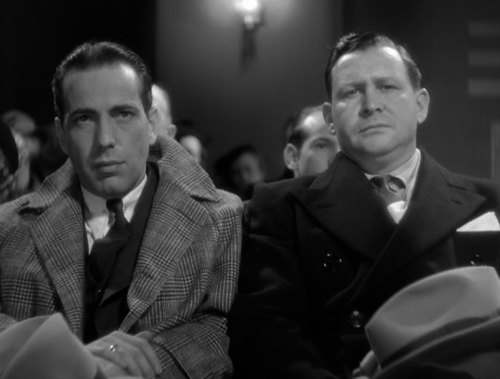 A gunman in Kruger’s gang, Bugs Fenner (Humphrey Bogart), is suspicious and doesn’t like Johnny at all. Drama ensues between Johnny, Kruger and his merry gang of gangsters, and Lee Morgan, who suspects that Johnny has betrayed her. 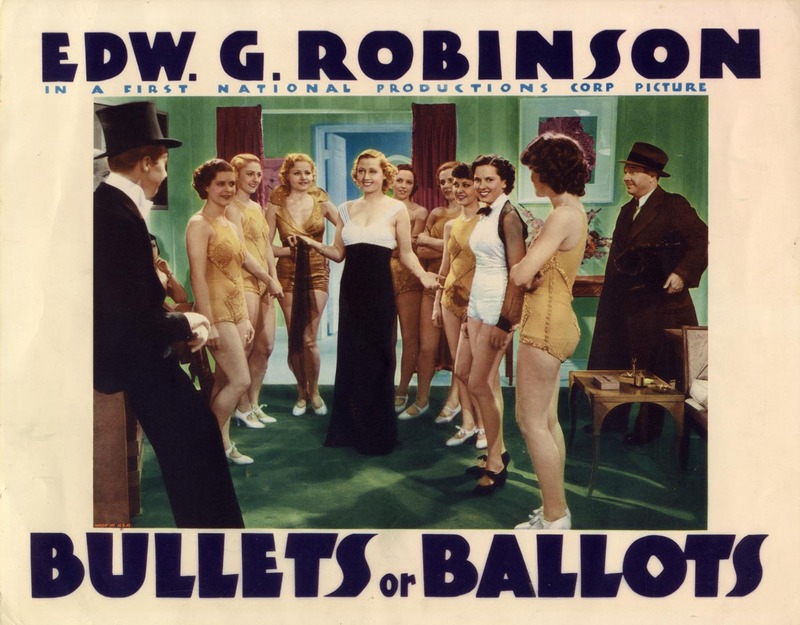 Bullets or Ballots is directed by William Keighley (1938’s The Adventures of Robin Hood, 1935’s ‘G’ Men) and based on the story by Martin Mooney and Seton Miller. The film was released in 1936 by Warner Bros. and featured the tagline “Every real citizen should see it!,” which could be construed as a jab at the Production Code Administration’s attack on the studio’s gangster films. As a result of that pressure from the PCA, this film emphasizes the lawful. Robinson, who typically performs in hardened gangster roles, plays an undercover cop here. He still gets to show his edge as he must remain believable while carrying out his undercover duties, but he’s still on the right side of the law. At the same time, this film doesn’t look down on the so-called “bad” characters. These are no low-level, uneducated street thugs. They’re all intelligent people who happen to fall on the wrong side of the law, working to make a living and get what they want. It would be tough to find a better cast to fill these roles. Robinson, Bogie and Blondell are all phenomenal as usual, effortlessly drawing the viewer into the story. I could write all day about how these actors are not only capable, but also truly magnetic. The characters that they portray are interesting despite their typicality. Joan’s character is probably the most likable. She seems nice, treats people fairly (for instance, giving Nellie credit where it’s due for coming up with the idea for lottery that they run) and has a good head on her shoulders. Even though her business is less than legal, she seems to have only the best intentions. She’s also very strong-willed, which is a trait that I enjoy in any character. Characters aside, this film follows all of the crime drama genre’s conventions quite closely and as a result can be somewhat predictable. However, this doesn’t completely hamper things: it’s still a good watch for genre devotees or fans of any of the actors involved. And it’s very well executed in all respects, from performances to directing to photography to script. The elements work well together here, even if the film as a whole isn’t very different from any other crime drama, and the level of excitement grows exponentially in the final quarter. And the features don’t end there. Also included are a featurette titled Gangsters: The Immigrant’s Hero, commentary by a film historian, a 1936 blooper reel (which is hilarious, as are all of the Warner “Breakdowns of” reels), How I Play Golf by Bobby Jones no. 10: Trouble Shots and a radio show featuring Mary Astor and Edward G. Robinson. This is one amazing DVD. DVD score: 5/5! What a great quote! I love him as well. I’ll watch anything he’s in.